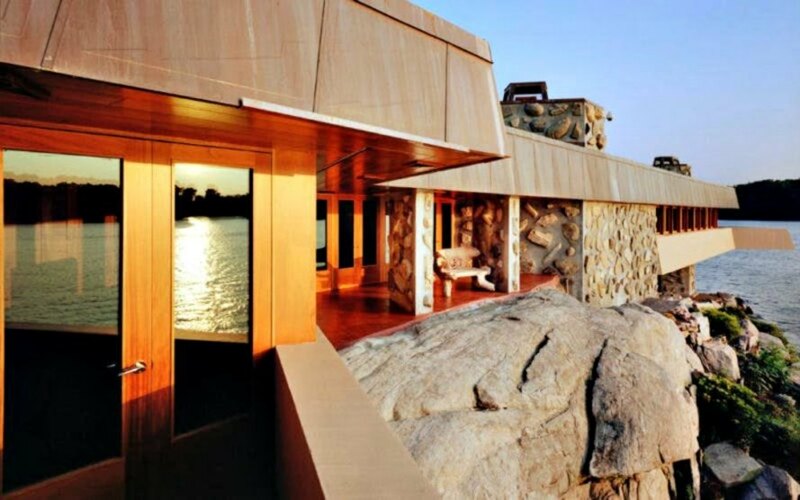 Do you dream of island living and Frank Lloyd Wright homes? We’ve found the perfect property for you. 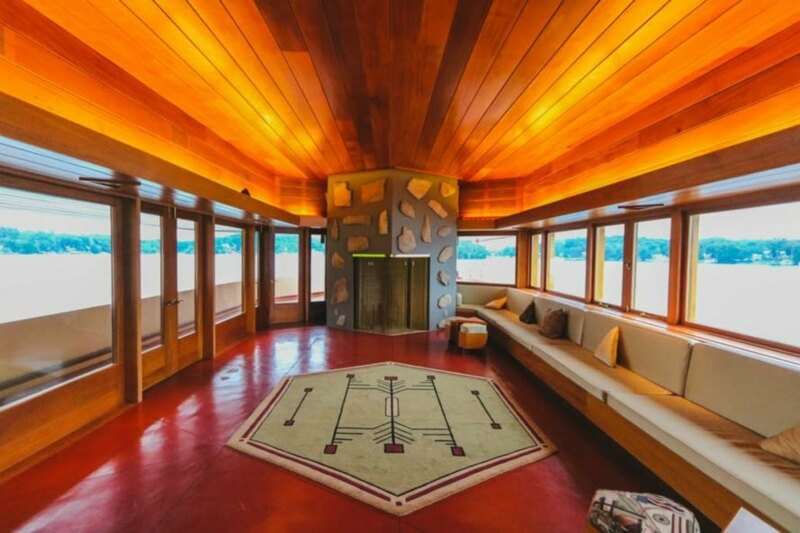 Located on the 11-acre, heart-shaped Petra Island in New York’s Putnam County is a six bedroom, three-and-a-half bathroom abode designed by the famous architect himself. Chilton & Chadwick just listed the incredible property with a price tag of $14.92 million. Every aspect of the triangular home bears Wright’s signature design. Even modern improvements made by Joe Massaro, who purchased the house in 1995, don’t take away from the Wright’s initial vision; rather, they add to it. Apartment Therapy reports that Massaro spent several years upgrading the property, and part of his efforts included expanding the main residence as Wright outlined in blueprints. Throughout his renovations, Massaro felt compelled to stay true to Wright’s design aesthetic. In fact, he claims an interest in architectural detail was inspired by his time on the island. A tour through the home reveals boulder stones decorating the concrete walls, a 1950s retro kitchen and a geometric skylight, designed like a maze of triangles, hovering near the center of the home. There’s more to be dazzled by than the interior; the cottage also offers stunning views of Lake Mahopac. With a guest house, tea house and a dock on the premise, it’s the perfect family vacation spot. Thanks to a wraparound patio and huge windows, it’s easy to forget one is just a short flight away from Manhattan. If leaving in a hurry, residents can take advantage of the rooftop helipad (helicopter not included) and make it to the Westchester County Airport in just 4.5-minutes. In an interview with Mansion Global, Massaro revealed that some of his inspiration was received while he was sleeping. In fact, he claims Wright visited him in a dream and shared the idea for custom-colored lighting. “I said, ‘Well Frank told me to do it,'” said Massaro. ”Detail was not is in my DNA until I stepped out on that island.” Whatever inspired the renovations in line with Wright’s work, we’re glad, for it’s an absolutely breathtaking property. Do you dream of island living and Frank Lloyd Wright homes? We've found the perfect property for you. 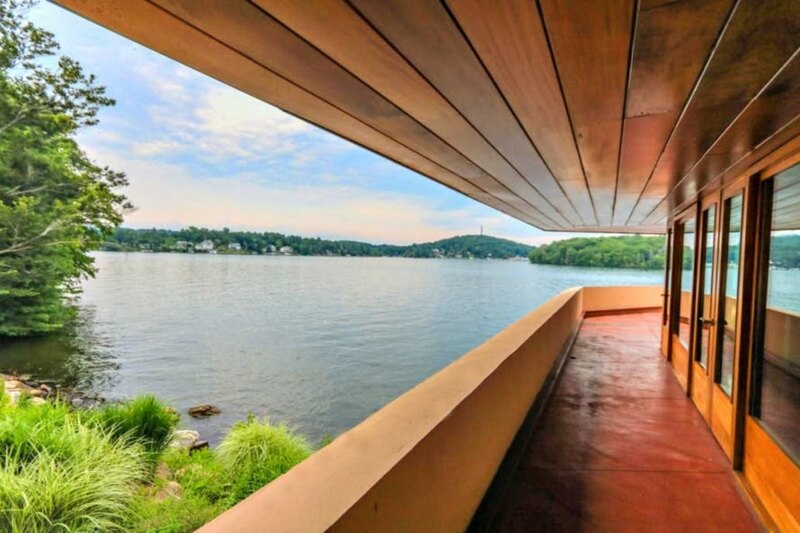 Located on the 11-acre, heart-shaped Petra Island in New York’s Putnam County is a six bedroom, three-and-a-half bathroom abode designed by the famous architect himself. Chilton & Chadwick just listed the incredible property with a price tag of $14.92 million. 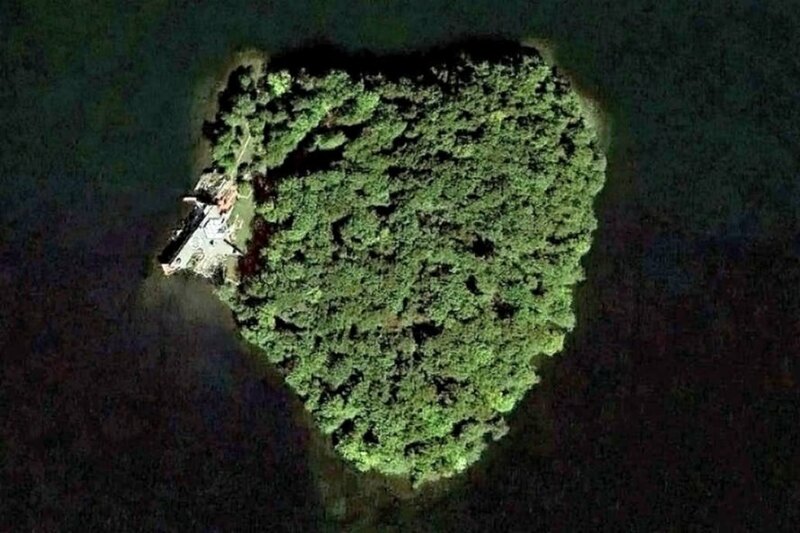 The 11-acre, heart-shaped Petra Island is located New York’s Putnam County. The property features a Frank Lloyd Wright house. With a guest house, a tea house and a dock, it's the perfect getaway for families. The house was renovated by Joe Massaro, who purchased the island in 1995. Throughout the renovations, Massaro stayed true to Wright's original vision. The Frank Lloyd Wright house has six bedrooms and 3.5 bathrooms. When one steps outside, they are greeted with breathtaking views of the nearby lake. A wraparound patio and large windows allow plenty of sunlight to filter inside. The property is on the market for $14.92 million and is the perfect family retreat.